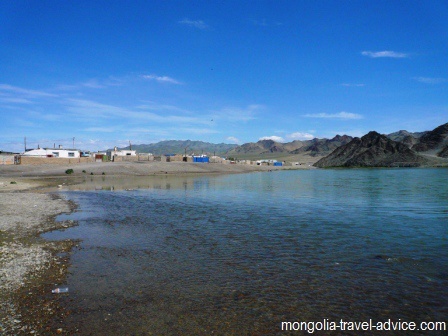 Photos Mongolia: Pictures of attractions and sights throughout Mongolia. Photos Mongolia: below are more pictures taken from my travels throughout Mongolia. Follow the links below to learn more about any of the places you're interested in. 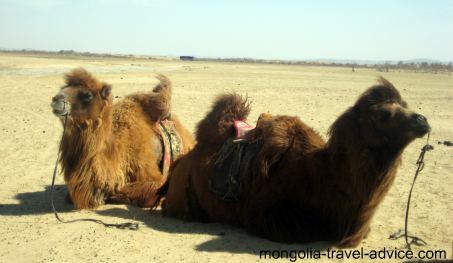 Camels in the Gobi desert, still with their winter coats on. 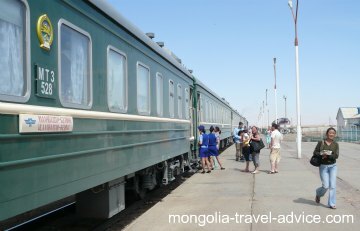 Mongolia photos: Taking a break outside the famous Trans-Siberian train, which travels through Mongolia. 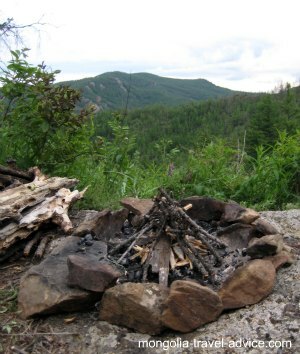 Mongolia photos: Hiking in Tavan Bogd in Western Mongolia's Altai Mountains. 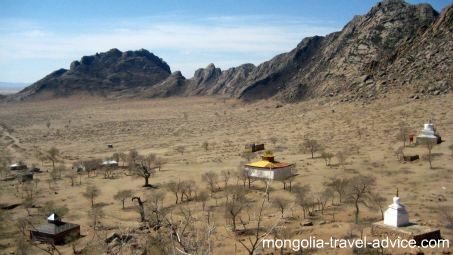 Photos Mongolia: Ruined temples in the Gobi desert. 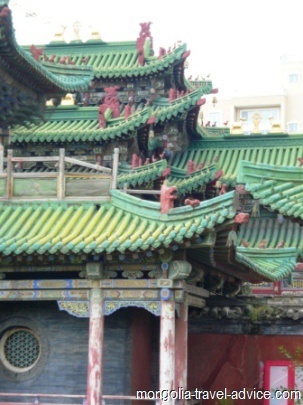 Unfortunately, sacked temples and monasteries are common in Mongolia due to the Communist purges of buddhist lamas which took place in the 1930s. 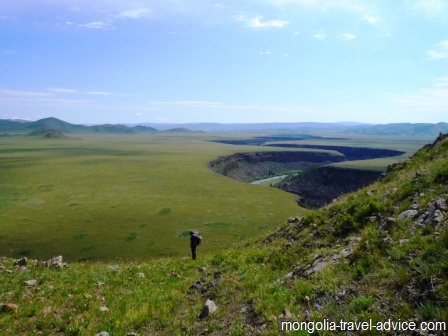 Mongolia photos: the rolling hills and valleys of Central Mongolia make for some great trekking. 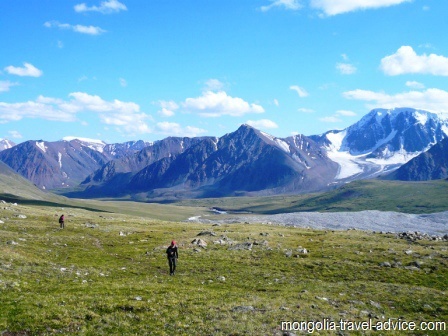 Hikers need to be well prepared; click here for a detailed packing list for Mongolia. Photos of Mongolia: Buddhist ovoos are a common sight. 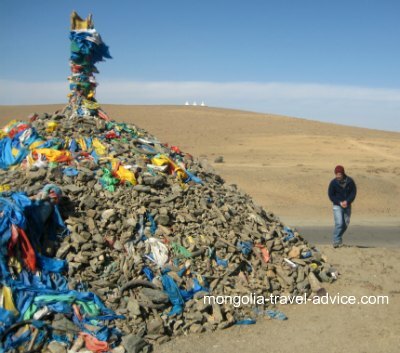 Mongolians follow Tibetan Buddhism, and leave offerings of blue scarves, vodka or cigarettes to please the spirits before a journey. Read my page on religion in Mongolia for information on Buddhism, Shamanism, and religious practices in Mongolia. 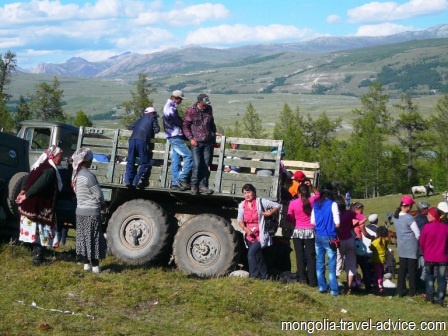 Mongolia photos: Onlookers watching from a big Russian truck down on the finish line of a naadam horse race. Boys as young as five come galloping in from 10 miles across the valley: it's an amazing sight. 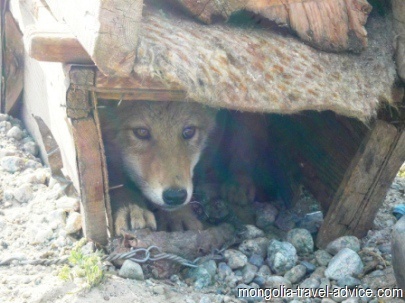 A captive wolf pup in Northern Mongolia. Wolves are numerous in West Mongolia during winter, and the locals see them as pests which attack their livestock; they shoot them with little sympathy. 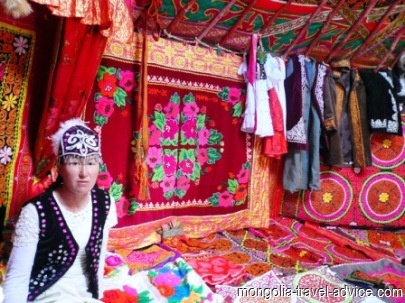 A Kazakh lady selling hand-woven textiles inside a ger in Western Mongolia. Click here to read about unique culture of the Kazakh minority.